December 3: Nomination papers available. Visit the Town Clerk’s office in Town Hall during regular business hours (8:00am to 7:00pm on Monday; 8:00am to 4:00pm Tuesday, Wednesday, and Thursday; 8:00am to 1:00pm on Friday). January 8: Town Caucus. 7:00pm, Reed Room, Town Hall. Candidates for elected boards are nominated and voted on by caucus attendees. Any registered Bedford voter may attend the caucus. The top two candidates for each office, garnering at least 8% of the votes, will be listed as “Caucus Nominee” on the ballot. January 14: Last day to obtain nomination papers. Non-caucus candidates can pick up nomination papers from the Town Clerk’s office during regular business hours (8:00am to 7:00pm on Monday; 8:00am to 4:00pm Tuesday, Wednesday, and Thursday; 8:00am to 1:00pm on Friday). 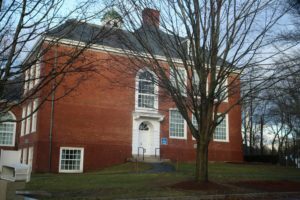 January 16: Last day to return nomination papers to the Town Clerk. Non-caucus candidates must submit the required number of signatures (50) from registered Bedford voters to be placed on the ballot. February 7: Last day for candidates to object or withdraw from the ballot. February 19: First day to submit absentee ballots. If you know you’ll be out of town or otherwise unable to vote on Election Day, you can vote absentee. Absentee ballot applications are available through the Town Clerk’s office. Ballots can be mailed or cast in person at Town Hall during regular business hours, up to noon on the day before Election Day. March 9: Town Election. Polls are open from 8:00am to 6:00pm at the John Glenn Middle School gymnasium, 99 McMahon Road. You can learn more about all the candidates in The Bedford Citizen. Your vote is your voice in Bedford: use it! Please confirm all dates and times with the Town Clerk (781-275-0083).